Many AutoCAD Civil 3D users may not be aware of some extra goodies found from the Map 3D platform which foundations Civil 3D. From importing and exporting geospatial data to geo-referencing imagery in the correct coordinate system, we can take advantage of the Map 3D status bar component. Exit AutoCAD Civil 3D 2010. In the Registry Editor, locate the following key:HKEY_CURRENT_USER\Software\Autodesk\AutoCAD\R18.0\ACAD-8000:xyz\Applications\AcMap (where xyz are numbers and characters that vary depending on the installed language version of AutoCAD Civil 3D). Right-click the “Statusbar” REG_DWORD. On the Shortcut menu, click Modify. In the Edit REG_DWORD dialog box, under Value data, enter 1. Exit the Registry Editor and launch Map 3D 2010. To remove the AutoCAD Map 3D drawing status bar components, set the Statusbar value to 0. 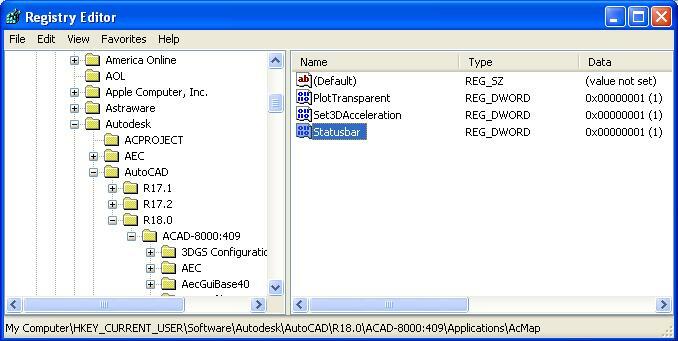 Note: You cannot add or remove the AutoCAD Map 3D 2010 drawing status bar components while AutoCAD Civil 3D 2010 is running. Warning! Problems caused by improperly editing the Windows registry could render your computer operating system unusable. Microsoft provides a wealth of critical information that you need to know about the registry in the Microsoft Knowledge Base. Use the Microsoft® Registry Editor only at your own risk and only after backing up the registry as well as the system.dat and user.dat files as outlined for your operating system in the Microsoft Knowledge Base and in the related Autodesk solution, http://support.autodesk.com/getdoc.asp?id=TS66513. Additional information about the registry is also contained in the Help topics in the Microsoft Registry Editor. Share drawings with other people. View and edit DWGs without downloading any software, using just a Web browser. Invite your project team to an online meeting where all sides can discuss and co-edit a drawing in real-time. Or browse through comments and changes on your own time. Use Project Butterfly to collaborate with colleagues and clients. Anyone can access Project Butterfly, even if they don’t have AutoCAD installed, and even if they don’t have a Project Butterfly account. You will need to provide a username and password, then you will be able to utilize the full funtionality of the new AutoCAD over your web browser. Interesting article about modern day surveying and mapping. We have Civil 3D 2010 and Raster Design 2010 installed on our computers. A problem arose when trying to SAVE after inserting a SID file using the IMAGE INSERT command from the Raster Design ribbon. The following error message was displayed and the drawing could not be saved. So, on my CPU, I went to Control Panel and removed Raster Design. I then had to do a Repair on Civil 3d 2010. At that point the MAPIINSERT command would not recognize MrSID files. I then installed the raster object enabler. At this point I could use MAPIINSERT and MAPWSPACE to insert SID files and was able to save the drawing. I then went to a CPU that still had Civil 3D 2010 and Raster Design 2010 installed on it and found that I could use MAPIINSERT to insert a SID file and save the drawing. But if I then clicked the Image tab to bring up the image ribbon, I could no longer save and again got the above error message. So I then went to a third CPU with Civil 3D 2010 and Raster Design 2010 installed and was able to repeat the above scenario. On this CPU, however, I went into the CUI dialog box and shut down the Image tab so that the Image Ribbon cannot be clicked. As a temporary fix I will instruct our users to use MAPIINSERT to bring in SID files and inform them to “under no circumstances” click the Image Tab and will begin going around to turn off the Image ribbon. After that I will discuss removing Raster Design completely. This post is courtesy of Jim Hamilton of Centerpoint Energy. There are some known plotting issues when upgrading to Windows 7 64-Bit. The problem here lies in the .pc3 files. You can copy your old .pc3 files that you have used for years, but the problem is not solved. To fix this problem, you MUST go to the Plotter Manager>Add Plotter Wizard, and recreate the .pc3 file. Problem fixed.